According to official sources, it looks like that this year it was the edition of records. It was probably for the 25-year anniversary of one of the most important automotive fair in the world. Or maybe for the process of hybridization is taking place in our sector. Who would have thought in 1999 that Google o Apple would built not only their own cars, but also that cars would be driven by themselves? It must have been for the increasingly attention towards a sector that provides products, solutions and support to the daily life of all, whose choices necessarily fall back on the lives of our communities and the environment that surrounds us. It must have been because Frankfurt is the perfect background with its contrast between old buildings and skyscrapers, history and business. The point is, this year at Automechanika, all the attendances have increased. The exhibitors: more than 5000. Visitors: 136.000. 10.000 new attendances. To read this it appearS a low-level data compared to the total presence. But it is extremely significant. This demonstrates the more and more attention and curiosity for an area that, until few years ago, was meant only for the relations between exhibitors. 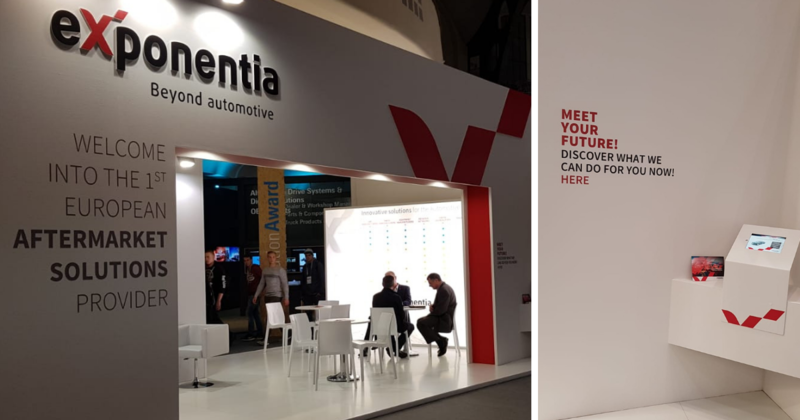 I follow with interest the editions of Automechanika, since 2008 with eXponentia, the company that currently I’m proud to represent, and I can say that over the years, the attendance of visitors and curious has considerably increased. 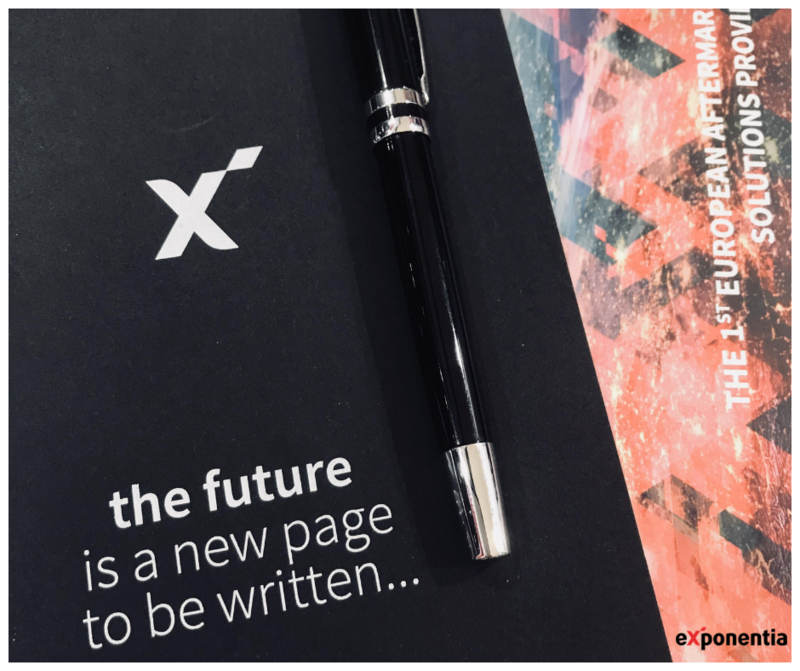 For us this created the need to improve the disclosure of the services to an ever-wider public, which is increasingly careful to understand not only the solutions offered but also our vision of the future. Automechanika Academy is an example where these requests find their own official place at the fair. In fact, here it is possible to sit down and listen freely seminars focused on the evolution of the automotive sector, with regard to new trends. If I had to sum up in one concept this edition of Automechanika, I would use the word “transparency”. A wonderful Latin word composed of the prefix “trans”, means “through” and “parere” that means “appear”. Lot of cars, thanks to technology, became literally transparent, as a matter of fact. Visible, clear and interconnected components with data updated in real time on high-definition screens. By the use of the virtual and augmented reality, today we are able to support with ease our reparers, the ones who literally look “through” the cars and receive assistance from multi-lingual technicians. The transparency is not only about the facilitation of learning new repair techniques, but, of course, also the vision of the future it is intended to pursue. In our stand we left the freedom to visitors to discover our solutions, compared to their sector. What’s the Classic cars trend tell us? Beside this dimension of constantly technological evolution, are visible other interesting trend to analyse. For example, the new wide discover of vintage cars. There have been many meetings and presentations of expert repairers on how to take care of historical cars. On the one hand, therefore, we have digitalisation and sophisticated automated and repair systems, such as the one presented by Porsche. On the other hand, we have the renovation and maintenance of vintage cars. This goes to support that, as always, when the true innovation is clear, it comes to amend the processes as well as the tools. In the industry of Spare-Parts sale, the first 3D printers have appeared. They are able to produce, for now, only some kind of components. We can imagine what it might leads the evolution of this means in the next future. We know very well there is only one way to face the change: being prepared. The idea of future, that many sector’s analysis announced, was replaced by a more logical integration of different requests and needs in a succession of innovations, mixed in the whole supply chain up. To see that, it’s enough to take a walk around pavilions, where competition and integration are moving on the same territory. By all this, they are not just the companies that implement more innovative processes, to reap the benefits, but also the professionists that enjoy their assistance services, and especially the drivers. The changes which have turned upside down the market, both in technological terms and distributions logics, have requested new technical and consultancy services to support the business. It’s not possible to imagine a participation that is not both international and synergistic. “Automechanika has never been so focused on future”. It’s true. Nowadays, digitalization, environmental vehicles, classic cars, interconnected car, online workshops and sustainable mobility coexist in a colorful kaleidoscope of services that renew and review themself day by day. Because one thing is for sure: to change everyday are not only the cars, their own spare-parts and the repairs methods, but also their buyers, with their habits and wishes. Good chances, in our opinion, as long as they updated constantly their own skills and keep their own curiosity alive. Reed Hastings of Netflix, recently, claimed jokingly that “the real competitor of Netflix is the sleep”. Similarly, we might say that the real competitor in our sector will be the other communication supports. The era of the cars able to entertain their drivers and passengers, has just begun. The areas of application are countless, expectations are very high, the outlooks are stimulating. See you at Automechanika Frankfurt 2020!